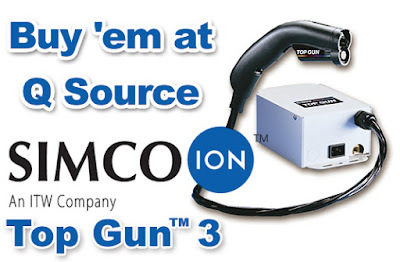 Simco-Ion’s lightweight, ergonomically designed Top Gun™ 3 ionizing air guns are available in 11 different configurations from QSource.com. These top-quality ionizing guns provide high blow-off force for rapid static discharge and efficient cleaning for a variety of industrial applications. The Simco-Ion Top Gun 3 features a flow control valve (for adjusting air flow levels), an ionization indicator light (for verifying ionization), and a filter (to ensure that clean air gets to the target surface). Available Top Gun 3 configurations at QSource.com include models with controllers, with 7’ or 14’ Cables/Hoses, with the Sidekick Hands-Free Stand, with optical sensors, and with 120 or 230 volts. The UL- and CUL-approved Top Gun body was designed for user comfort and has a flexible cord and easy-to-use trigger switch. User safety is also addressed with the controls integrated into the body, a heavy vinyl-covered metal shielding for the cable, and the unit’s “shockless” design, which prevents users from being shocked if the ionizing point is touched. For added convenience, the Simco-Ion Top Gun accepts compressed air or inert gases (including nitrogen). Visit our Simco-Ion Top Gun 3 Series page at QSource.com and purchase the exact Top Gun 3 configuration to meet your needs. Check out our Simco-Ion page for additional products. You may also contact us by phone (800-966-6020), email, or via our Web site.